Early in the morning on the first day of summer, I stood on my porch and took a look at the garden. It's not a classic backyard garden, but then, I didn't want it to be. When I bought the property, it was heavily wooded with mature Douglas and Grand Firs. A strip along the beach was more open with many native shrubs, plants and small trees. These included Salal, Oregon Grape, Nootka Rose, Madrona and Red Currant. 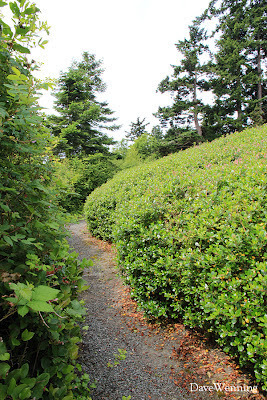 Ocean Spray, Indian Plum, Sword Ferns and Snowberry were growing in the shady spots next to the road. 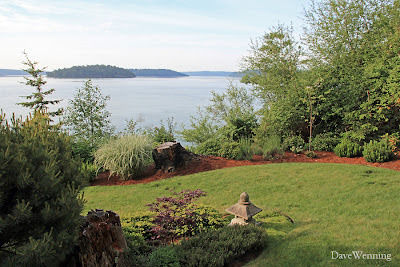 Having spent a childhood traipsing the woods around Gig Harbor, Washington, all these things made me feel at home here. Typically, property like this is first logged and denuded of all vegetation to create a home site. Then, big lawns and suburban style gardens are planted around the house. My vision was to keep the big trees and use the wild places of the region as a pattern for creating a garden. At the time, I hadn't even thought about wildlife. This has been a difficult gardening project, much more difficult than I imagined. The glacial soil is made of sand, rocks and clay and has low fertility. The big trees are resource hogs. At the edge of the Olympic Rain Shadow, we receive about half the rainfall that Seattle gets. Drought tolerance has been a primary concern. This garden has required a lot of trial and error. Looking around to see what grows naturally was a necessary starting point. Perhaps others interested in creating a wildlife garden will find some ideas here. This lawn actually accommodates the septic drain field. 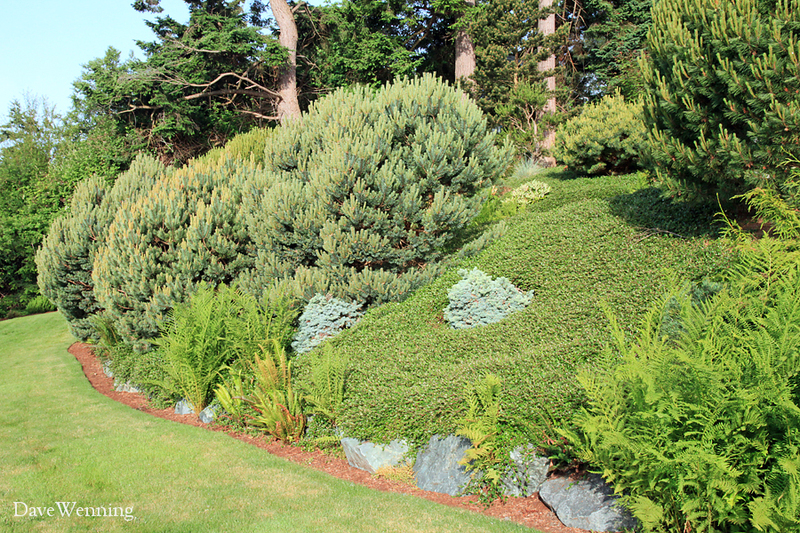 Plantings are a mixture of ornamental exotics and natives. I am particularly fond of rhododendrons. We have a native rhododendron that happens to also be the state flower. 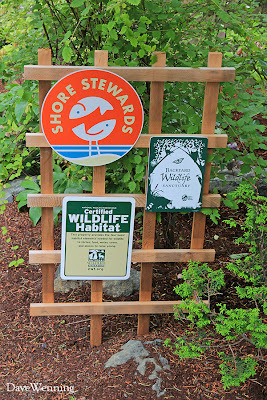 They grow wild on Whidbey Island just across the bay. With the forest edge habitat they like, I tried to grow one here, but it was a miserable failure. Root weevils went right after it and despite some TLC, it languished and died. On the other hand, nursery stock rhodies seem to thrive and serve quite well as stand-ins. When choosing plants for any garden, start with what grows wild in the area. Their cultivated relatives will often be good choices. For me, the wildlife thing just happened on its own. Early on, I hadn't done anything special to attract it. But the wildlife came and I was delighted. Without realizing it, by creating a garden patterned after the Northwest forests around me, all sorts of birds and mammals felt it was safe to come and visit. Black-tailed Deer used that patch of lawn as a place to sleep. The first Douglas' Squirrel I ever saw was in this yard. Birds I had never seen before became regular visitors. I bought a book. I hung a feeder. I was on that proverbial slippery slope. The palette of the Pacific Northwest consists of dark tones. Skies that are often overcast and shade contribute to this ambience. Perhaps it is why regional wildlife tends to be darker in color than in other parts of North America. The Townsend's Chipmunk, Douglas' Squirrel and Steller's Jay are examples. In a previous post, I discussed Water. Without realizing it, my messy, cluttered garden with native plants (some might call them weeds) provided one of these criteria, namely Cover. Wild animals are more likely to visit a backyard if they feel safe there. 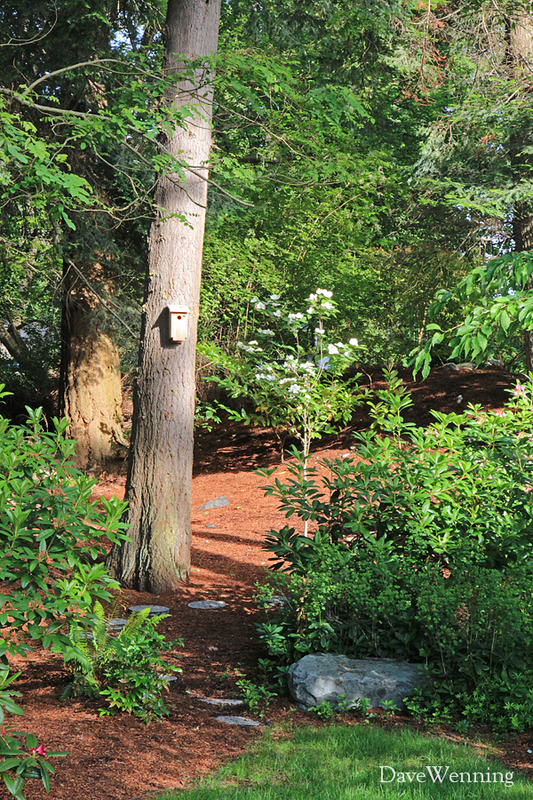 Providing places to hide with shrubs, plants and brush piles will encourage these visits. They will more readily come out into the open if there is a spot nearby where they can quickly duck out of sight. 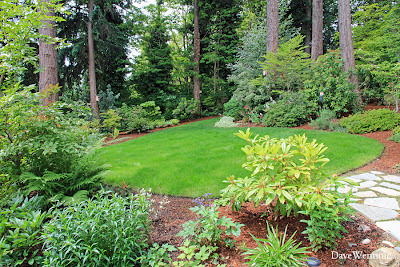 Providing cover will become the most important element in a garden's overall design. 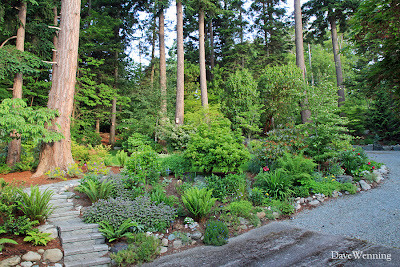 Visits to the Anacortes Community Forest lands gave me ideas for this area. Anyone who has walked through a mature, Northwest climax forest will notice that the ground under the trees is often carpeted with Western Sword Ferns. I am going to attempt to reproduce this. 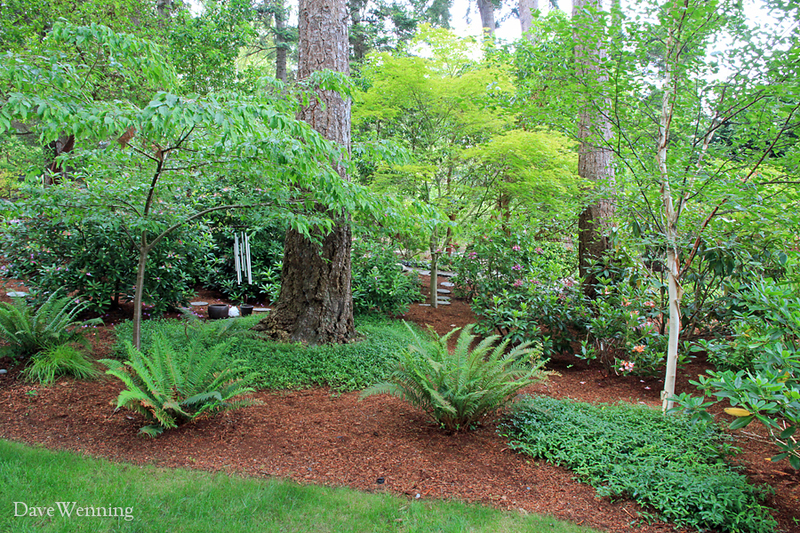 I have chosen plants that will tolerate the deep shade under the firs. As a centerpiece, I started with a Pacific Dogwood hybrid called 'Venus' (left) which is now blooming. It has the huge blossoms of the native Pacific Dogwood with the disease resistance of Korean Dogwood. I have laid out a pathway and added a lantern framed with Japanese Aucuba. The variety 'Picturata' has bright yellow leaf centers and surprised me with big, shiny red fruits. So far, so good; they all survived the winter. I am told the Japanese text on the lantern reads "welcome." I would appreciate if someone could verify that. In the entry, I will be adding patches of Japanese Pachysandra and Vinca minor ground covers. Finally about 1,000 square feet (93 m²) in the back behind the dogwood will be planted with Western Sword Ferns (.pdf). I'll do this when the rains begin this fall. These indigenous natives will provide lots of cover for scurrying and hiding. 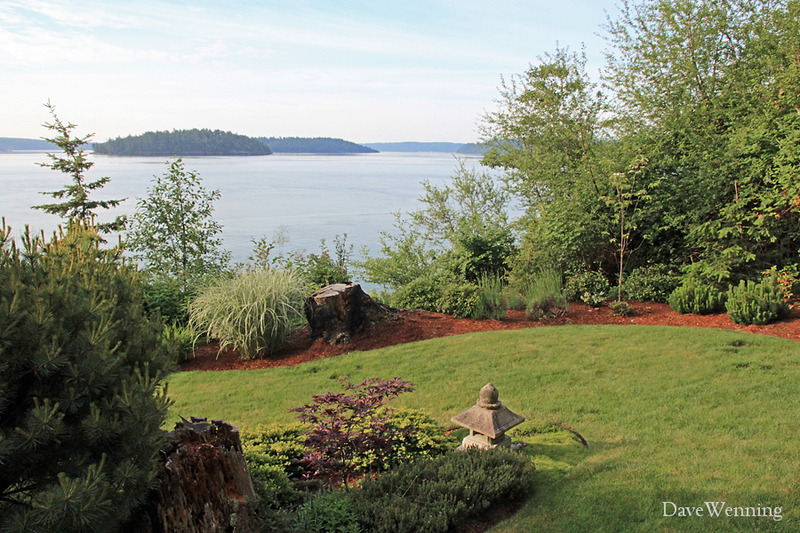 I believe the naturalistic Asian garden styles blend nicely with the Northwest look. Wish me luck with this project. The koi pond and waterfall near the front door is a favorite bathing and whistle-wetting stop for birds. They come in groups by species at different times of the day; Varied Thrushes at one time, Goldfinches at another, etc. 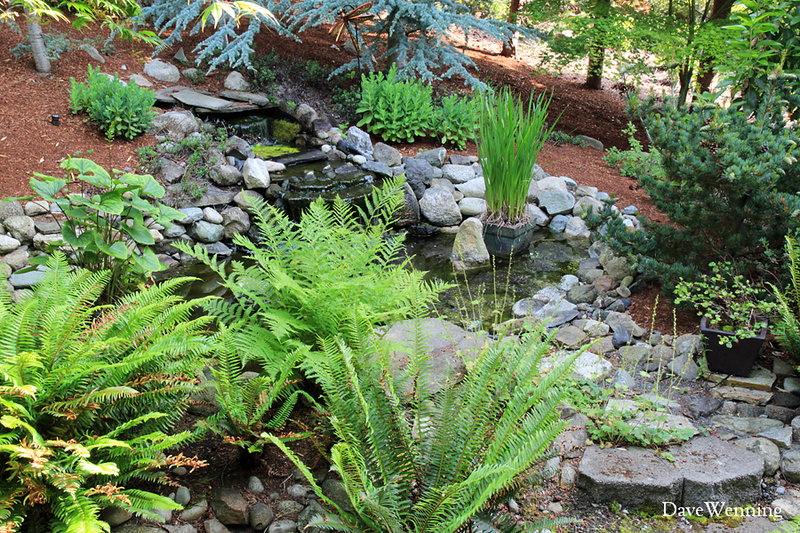 Again, plantings around the pond offer refuge. They also help to obstruct Great Blue Herons who try to use the fish and frog pond as a cafeteria. Believe me, encountering a big Heron when coming out of the front door is an experience not soon forgotten. The property is on a slope, so the garden consists of a series of banks and terraces. In the more open front yard, 'Tanyosho' Japanese Red Pines provide hidden nest sites that sparrows require. I discovered this when I noticed the birds flying in and out of them. If my guests at the front patio bird feeders spot me, they head straight for these pines for for quick escape. A foot thick ground cover of Cotoneaster dammeri is drought-tolerant and serves as defense against the aggressive, non-native Himalayan Blackberry. This introduced invader is constantly trying to colonize any open ground it can find, including the lawn. The C. dammeri will be blooming shortly and become alive with Honey Bees. I wonder what could be lurking underneath it. The Lady Ferns and Western Sword Ferns have sprung up on their own. Don't you dare call them weeds. When desirable, indigenous plants spring up like this, I usually just let them be. The lowest bank to the beach is covered with a meter-deep ground cover of Escallonia 'Fradesii.' The path to the beach runs around the edge of it. It blooms twice a year in June and December, tolerates wind and coastal conditions, and requires no watering once established. In warm weather, the foliage emits a spicy perfume and the flowers are attractive to bees and other pollinators. When I walk to the beach I hear a lot of scurrying in the leaf litter underneath it. I am trying to find a way to reduce or eliminate this lowest level of lawn. It is wet and spongy in the winter, but in the summer it becomes Death Valley. The soil is glacial till which turns to concrete ("hardpan") when it dries. If left to its own devices, it can become weedy and unattractive. Of course, there are also the Himalayan Blackberries to fend off. Grassy areas are not incongruous with the region. Landforms called rocky balds may be seen in nearby Deception Pass State Park. These are grassy and mossy areas over stony outcrops. I would appreciate hearing from anyone who has ideas what to do here. Be aware that the National Wildlife Federation backyard habitat program is a fundraising vehicle for them. They also share their mailing lists with other wildlife organizations. If you sign up, your monthly junk mail volume will increase significantly. I am a little annoyed by this, but I still believe this is a worthwhile program. 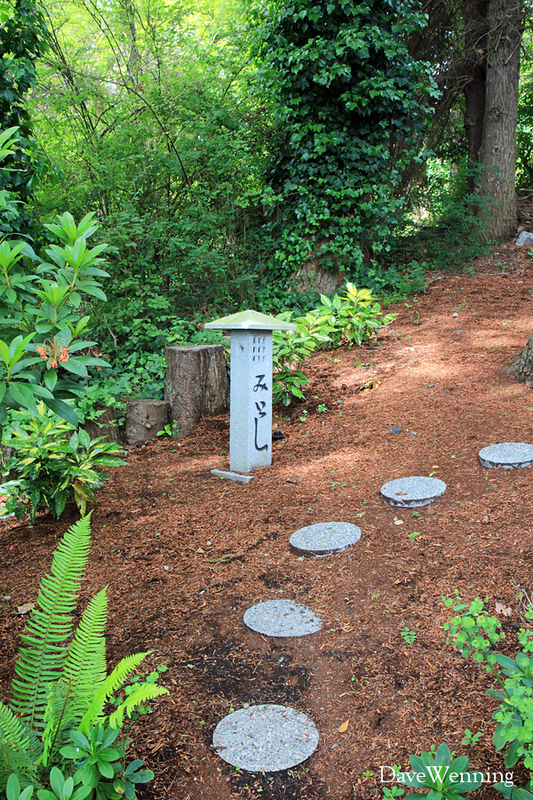 The Washington Department of Fish and Wildlife has a Backyard Wildlife Sanctuary program as well. This is an effort to offset the 35,000+ acres of wildlife habitat that has been converted to housing in the state. These are congenial folks and I have enjoyed working with them. They provide a lot of educational materials including the Crossing Paths e-newsletter. 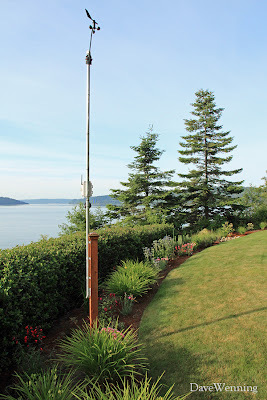 I created a blog post at Wild Fidalgo to accompany my application for certification. 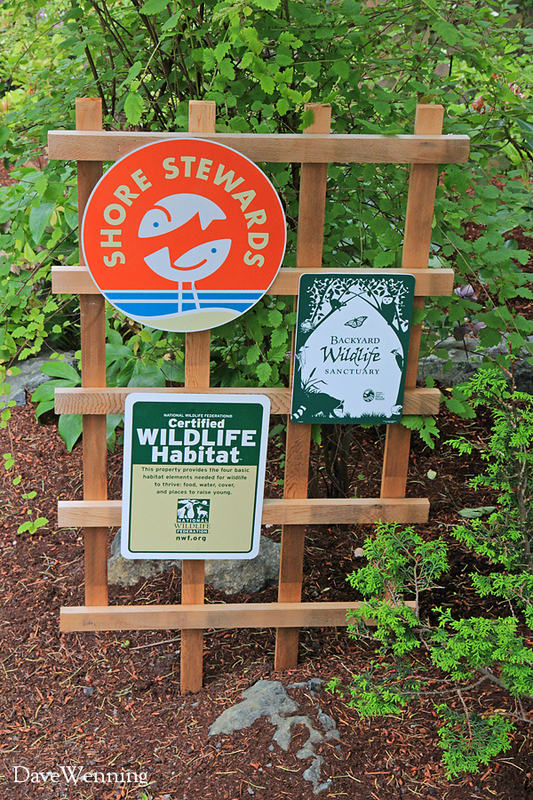 Washington Shore Stewards is a voluntary program for waterfront and stream-side property owners. We learn how to care for our beaches, bluffs, gardens and homes to preserve healthy shoreline habitats. Their Guide for Shoreline Living (.pdf) is one of the most useful booklets I have found. Hopefully, this will inspire others to look into creating a wildlife garden. Providing cover for wildlife is one of the four essential elements. It's also the most important factor when creating a garden design. I would enjoy hearing about other people's experiences and ideas for wildlife gardening. In a previous post, I wrote about "An Act of Vandalism." I had a shade garden. It was the most beautiful spot in the entire yard. Located along the road, it was where the property faced the public. I got complements from passers-by. It was my pride and joy. In an act of profound stupidity and incomparable evil, my shade garden was destroyed. Landscape maintenance guys like to take care of lawn and bare ground. For them, ground covers are a nuisance. Without asking first, all of the Oregon Oxalis, Pachysandra, Vinca major and Sweet Woodruff were declared to be weeds. First they were poisoned, then they were chewed down to bare ground with weed eaters. The lush vegetation that had taken ten years to get established was gone in an afternoon. In their herbicidal zeal, they also killed Fatsia, Astilbe, Hostas, Wood Ferns and Hellebores. One end of the garden was carpeted with Creeping Buttercup. That really is a weed, but it was a beautiful weed and perfect for the site. Rich green foliage sparkled yellow all summer. It has been replaced with bare dirt. It's not even attractive dirt. It's mud and rocks and dust. Now I have real weeds growing everywhere. The ground covers were replanted by the landscape firm. It has now been two years, but the garden is not even close to recovery. I am left with what still looks like a big open pit in the ground with bushes stuck in it. It was my favorite spot in the entire yard, but now I rarely go in there. If I can help it, I don't even look at it. This is why there are no photos of the shade garden in this post. Sorry to end this way, but writing about the experience helps me vent my anger. Thanks for posting your experiences and photos. I'll soon be trying to tame a couple acres in Pender Harbour, BC.